PokÃ©freaks are pokÃ©freaking out over the first new screens and details for PokÃ©mon Black & White that recently leaked. News on PokÃ©mon can never seem to stay in the PokÃ©ball. Details on the just announced PokÃ©mon Black & White have come out of Japanese magazine Coro Coro along with images that show that the games are evolving just like Mankey evolves into Primeape at level 28. Andriasang has the translation of the writeup for Black & White and it primarily involves the use of the third dimension. Characters and PokÃ©mon appear to be rendered in the same 2D style as past games, but backgrounds are displayed in 3D. First screens of Pokemon Black & White can be found on Serebii.net where the most notable shows the player's trainer standing between two 3D high-rise buildings. Battles also appear to have more of a 3D style as well. Coro Coro mentions three major evolutions for Black & White. 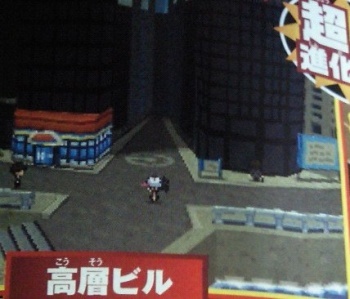 The first is the more realistic depiction of the environments, and more shops for the PokÃ©mon Center. The second is that PokÃ©mon battles will be more intense for an unknown reason. My guess is that PokÃ©mon can now die in explosions of blood and fur. The third evolution was not clearly revealed, but next to the section on it screens of the game's starting town and a dungeon were shown, so perhaps the games will begin in a new way not seen before. As a PokÃ©outsider, it's at least nice to see the series' graphics improve. However, if Joey returns and keeps calling about his Ratatta, I have a feeling PokÃ©mon Black & White could end up angering more than they please.